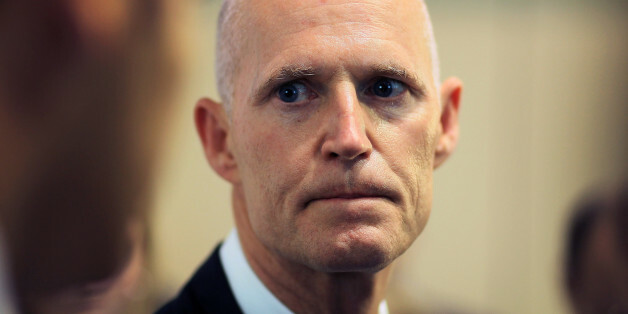 A Sarasota Democratic leader filed a complaint today against Rick Scott and his campaign with the Federal Election Commission as he continues to hide his campaign donors, and therefore his conflicts of interest, by not following federal election law. After emailing donors as early as March 29, soliciting campaign donations for his unannounced senate campaign, Rick Scott's senate campaign has failed to file the campaign financial report for the first quarter of 2018, which ended on March 31. Scott's campaign asked for $5,400 from individuals or $10,800 from couples via an email sent on March 29, during the first quarter of 2018. If one person contributed that amount, reaching the $5,000 threshold for federal candidates, Scott would have had to file a quarterly financial report for the first quarter by April 15. He has not. "Complainant respectfully requests that the Commission promptly act to ensure that Mr. Scott stops hiding his campaign activity from the general public and starts following the reporting requirements imposed by the Act and Commission regulations on every single candidate for federal office," according to the complaint from JoAnne DeVries, chair of the Democratic Executive Committee of Sarasota County. In filing her complaint, DeVries said "Rick Scott is not above the law. He coordinated illegally with his Super PAC, has refused to disclose his secret financial account that would show the extent of his conflicts of interest and now, he is skirting more laws to keep Floridians in the dark on what he's done as governor and as a senate candidate. This is especially alarming for Rick Scott who became $46 million richer as governor while hiding his secret account from the people of Florida." Scott has boasted of his fundraising, but is not following the law to show where he is receiving the money—some of it possibly from those with business interests before Scott as governor. The complaint and exhibits submitted to the FEC can be viewed here. For media interested in talking to Chair DeVries, please email [email protected]. This is part of a pattern of Scott not following the law and not disclosing his finances, hiding his conflicts of interest from the people of Florida. His first month in the race has been plagued with financial scandals. Campaign finance watchdog End Citizens United filed an FEC complaint, which it later amended to include even more details, against Scott for illegally coordinating with his Super PAC ahead of his Senate run. This follows a recent report about his political committee taking more than $50,000 from executives at firms after they received more than $200 million in lucrative new state pension business from Scott. Retired workers blasted Scott for playing politics with their hard-earned pensions. Scott has also dodged questions about him filing an extension and continuing to hide his secret account—following seven years of him hiding his conflicts as governor while he became $46 million richer. He is still fighting in state court to hide his account, which is not legal for Senate candidates after a window and after they exhaust their extension like Scott filed. The Florida Democratic Party launched this digital clock to track how long Scott has been in the race while hiding his finances. More information about Scott’s financial scandals is available at SelfServingScott.com.